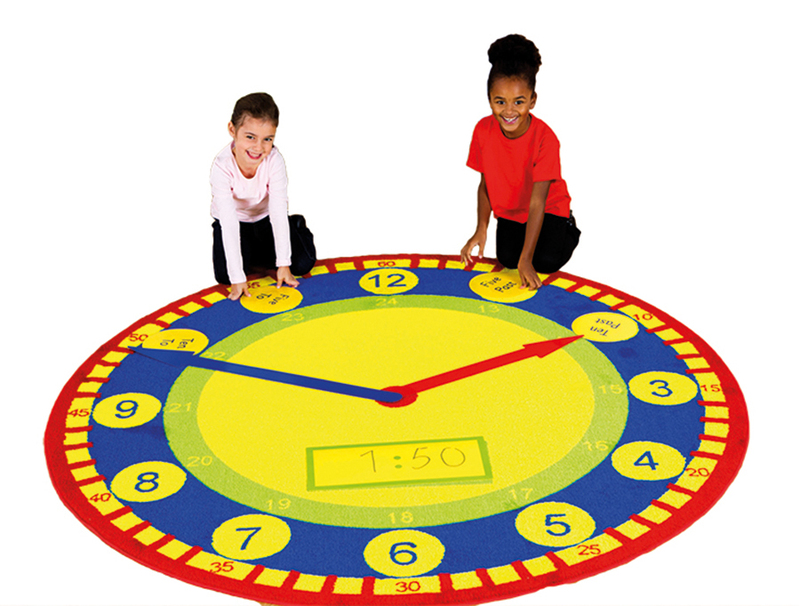 The Tell the Time classroom carpet and accessory pack has been designed to help teach the time and is ideal for use in schools. The circular clock carpet clearly defines hours, minutes and seconds with 24hr calibration and digital referencing when used with the accessory pack. The giant colour coded accessory pack includes the hour and minute clock hands, minutes and placement discs i.e. 45 minutes/quarter to. Also includes a write on digital clock to teach 24 hour, and clock hand equivalence. Recommended use with dry wipe or water soluble marker pens (not included). The accessory pack is printed on durable and flexible polypropylene plastic, with non-toxic inks. All plastic cards have rounded corners for safe use with young children. Designed with comfort in mind, the classroom rug is manufactured using a premium quality carpet with an extra thick, soft textured Nylon tufted twist pile and tightly bound edges. It features a specially designed anti-slip Rhombus backing to ensure safe use on all surfaces and meets essential safety standards EN71 Parts 1, 2 and 3.